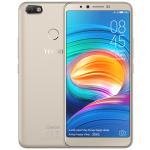 Recently, Tecno one of the prominent budget smartphone maker in Nigeria and a number of other African countries released a list of smartphones. One of whiich is the Tecno Camon X, a lesser variant of the Tecno Camon X Pro. The new smartphone comes with the latest design trend including a bezel-less screen with elegant tall 18:9 aspect ratio. Surely, the Tecno Camon X keeps up on how a modern smartphone should look like. In essence, the smartphone is one centered on taking pleasant selfies.